I do my best when I’m out to eat to take pictures of the food (doesn’t happen every time but often enough) but home has really become another story. I’ve addressed it before on the blog but I just wanted to mention it again in case you were wondering why I don’t share as many at-home food photos. My meals are repetitive and most of the time, my honest excuse is that I simply don’t think about it enough anymore! And you know that I definitely don’t think about taking pictures at breakfast these days but there’s something interesting about it I think. I realized yesterday that there may be a possible correlation between NOT taking food pictures at breakfast AND not feeling the need to deviate from oatmeal in a really long time. While oatmeal has been my go-to breakfast for years now, I would from time to time get sick of it or feel the need for something else. A part of me wonders if NOT stopping to take a picture or not thinking about my breakfast in relation to the blog has anything to do with my lack of boredom from breakfast? I’m on autopilot in the morning. Water (with apple cider vinegar), coffee, small bowl of oatmeal, a little more coffee, run, shower, post-run oatmeal. I like my routine! Perhaps excessive picture-taking of meals causes you to over think what you really feel like and actually are eating. Just a thought. I did take a few at home food pictures this week of what I’ve been eating for lunch and dinner. I’ve got a really easy, barely cooking attitude going and I like it. I’m back to cinnamon raisin Ezekiel toast with mashed chick peas and avocado plus a side salad. Trader Joe’s everything but the bagel sesame seasoning blend is key to the mashed chick peas and avocado, by the way. Takes it to another level! This is so easy to make and doesn’t take much thinking. My salads are so basic it’s borderline blogger embarrassing. Organic romaine lettuce and grape tomatoes with some sort of Trader Joe’s dressing. (Right now I really like the Trader Joe’s Champagne Style Vinaegrette). My brain wants nothing to do with extra ingredients. I mean it when I say I want to eat pizza and salad every day. 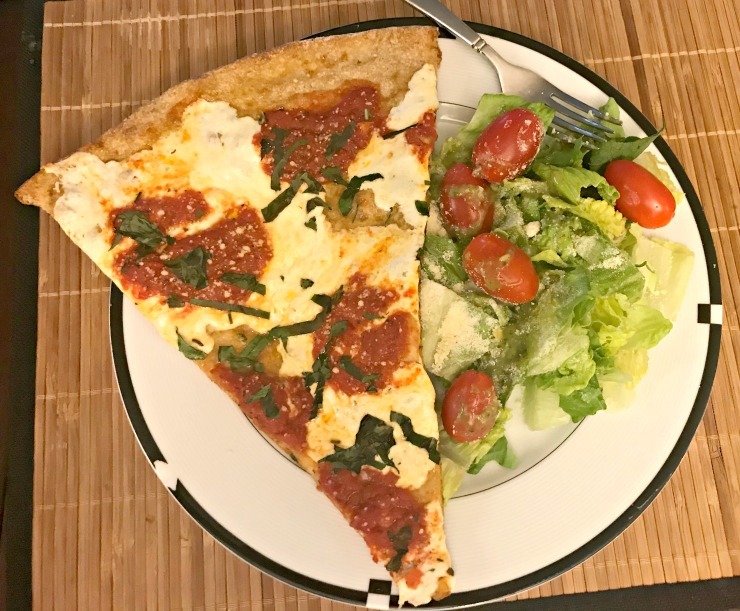 It’s easy and cheap enough to pick up a slice (right now it’s all about the whole wheat margarita pizza from Mario’s) and add my own side salad at home. The power bowl is an old favorite of mine which hasn’t been seen often this summer but I brought it back this week. 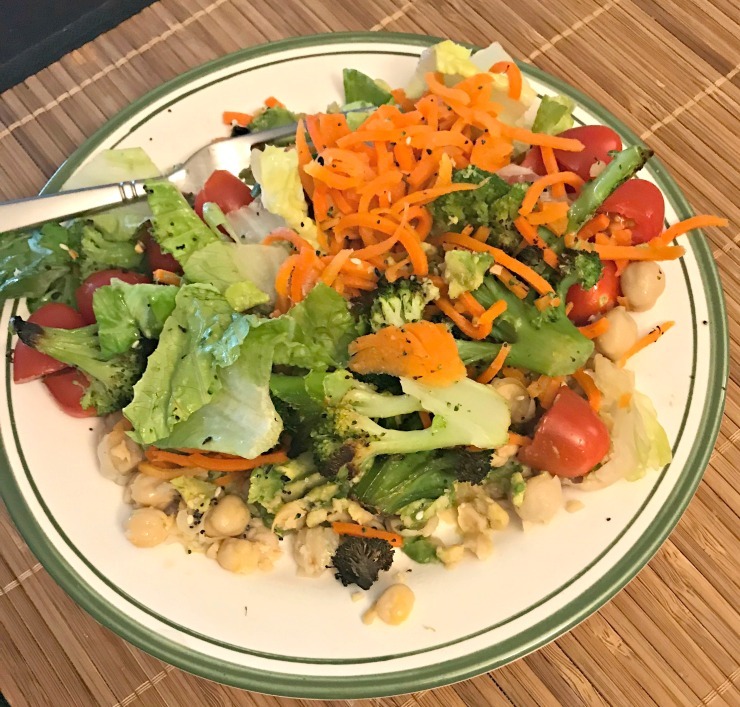 I haven’t had the patience to roast vegetables lately but I was running low on romaine lettuce yesterday so I had no choice. I roasted some frozen broccoli, added carrot spirals, mashed the chick peas with avocado and called it lunch. I cut up some watermelon this week. Not a whole watermelon, just a small piece that I bought at the grocery store because I cannot bring myself to buy a whole watermelon anymore and cut it all up. It was good I guess but I’m not obsessed with eating watermelon as I usually am during the summer which I attribute to running less. I’m still obsessed with Trader Joe’s semi-sweet chocolate chips. I eat them every day. Best snack ever. What have you been eating on repeat lately? Do you eat the same breakfast on autopilot in the morning? What’s your morning breakfast routine? Lots of Friday Favorites to share today! On repeat lately has been bananas. I used to not like the texture but now I buy a bag at Coscto every week! I’ve never thought to mash chickpeas but I can definitely see them being good on toast with some seasoning. I’ve been eating oatmeal for breakfast every morning for a while now too. I mix it up on weekends, but on weekdays, there’s nothing easier than a bowl of oatmeal with toppings (usually PB, fruit, and hemp hearts granola). The mashed chickpea and avocado sounds great! I’ll have to check it out. I eat the same breakfast every day – oatmeal with PB and fruit and coffee. 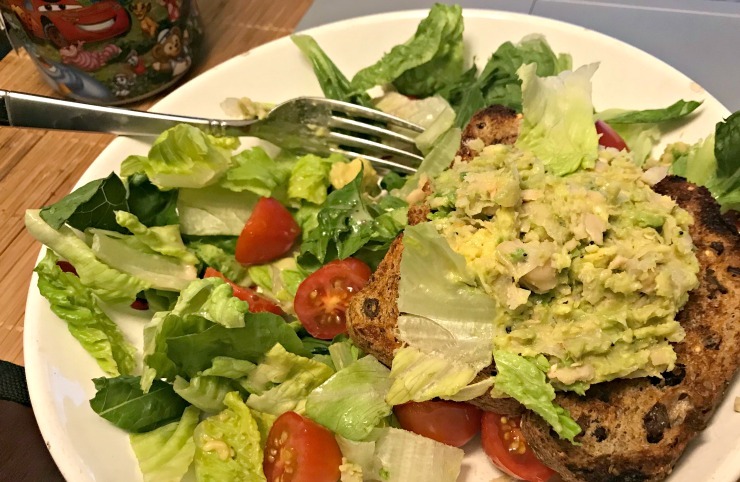 I need to try the chickpea and avocado toast, as avocado toast has been my go-to for lunch lately. I want to eat pizza + salad every day, too!! We got a pizza oven earlier this year so we’ve literally been making pizza a couple of times a week. It’s SO GOOD! Mmm pizza. It’a actually what’s for dinner tonight since the Hubby worked late last night.